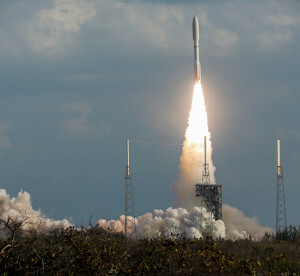 Lockheed Martin-built GOES-S weather satellite was successfully launched March 1 at 5:02 p.m., EST, from Cape Canaveral Air Force Station, Fla., aboard a United Launch Alliance Atlas V 541 rocket. A satellite launched March 1 from Cape Canaveral, Fla., will augment the GOES-16 weather satellite and provide broad coverage with powerful new weather monitoring technology for meteorologists to provide life and property-saving forecasts. On March 1, at 5:02 p.m., EST, NOAA’s GOES-S weather satellite, built by Lockheed Martin, was launched aboard a United Launch Alliance Atlas V 541 rocket and has successfully established communications. NOAA’s next weather satellite in the Geostationary Operational Environmental Satellite – R Series, GOES-S, which will be renamed GOES-17 upon reaching geostationary orbit, will be positioned to boost forecast accuracy for the West Coast, Alaska and Hawaii. With data from GOES-17, and the already operational GOES-16, the two satellites will observe most of the Western Hemisphere. These satellites will continue to deliver dazzling weather data that has captivated forecasters such as first-of-its-kind lightning mapping and high-definition views of weather systems. This sophisticated information will support short-term weather forecasts and severe storm warnings, maritime forecasts, and space weather predictions. Additionally, the technology will improve hurricane tracking and intensity forecasts, increase thunderstorm and tornado warning lead time and improve wildfire detection. Lockheed Martin designed, built and tested the satellite and is responsible for spacecraft launch processing. In addition to all four GOES-R Series satellites (R, S, T and U), Lockheed Martin also designed and built the Solar Ultraviolet Imager (SUVI) and the Geostationary Lightning Mapper (GLM) instruments that will fly aboard each spacecraft. NOAA funds, manages and plans to operate the GOES-R Series satellites. NASA oversees the acquisition and development of the GOES-R Series spacecraft, instruments and launch vehicle for NOAA. NASA’s Launch Services Program at Kennedy Space Center is responsible for launch management. The program is co-located at NASA’s Goddard Space Flight Center in Greenbelt, Md.